Evaluating the abilities of a human being is an extremely difficult task. This fact has not entirely prevented the use of various techniques of quick appraisal, some of which are well organized can be called “pseudosciences.” Among such practices are phrenology (skull protrusions), physiognomy (facial features), astrology (birth date), and graphology (handwriting). PHRENOLOGY Which focuses on personality and character, Phrenology is the study of the structure of the skull to determine a person’s character and mental capacity. In this science in which the personality traits of a person were determined by “reading” bumps and fissures in the skull. Developed by German physician Franz Joseph Gall around 1800 .Phrenologists would run their fingertips and palms over the skulls of their patients to feel for enlargements or indentations. The phrenologist would usually take measurements of the overall head size using a caliper. 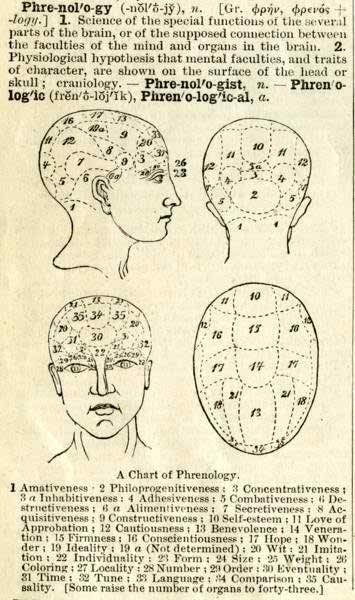 With this information, the phrenologist would assess the character and temperament. GRAPHOLOGY The term ’graphology’ was first used by the Frenchman Michon in 1875, from the Greek ‘grapho’ meaning I write, and ‘logos’ meaning theory. The study of handwriting and its analysis was first developed by the Chinese 3,000 years ago. The Romans used graphology is the study and analysis of handwriting especially in relation to human psychology. It is now an accepted and increasingly used technique for assessment of people in organizations. Handwriting analysis is an effective and reliable indicator of personality and behaviour, and so is a useful tool for many organizational processes, for example: recruitment, interviewing and selection, team-building, counseling, and career-planning. Handwriting must be studied taking into consideration the size and slant of letters, word spacing, line spacing the way zones are used, pressure and margins applied. -Child hood and are fearful of the life itself. -Apprehensive of intimacy and defensive. -This pattern indicates insecurity and impulsiveness. -Such persons are sensitive, possessive and intense. -At times they are unrestrained and capable of hysteria. PHYSIOGNOMY Is the assessment of a person’s character or personality from their outer appearance, especially the face. The term physiognomy can also refer to the general appearance of a person, object or terrain, without reference to its implied characteristics. The practice was well-accepted by the ancient Greek philosophers but fell into disrepute in the Middle Ages when practiced by vagabonds and mountebanks. It was then revived and popularized by Johann Kaspar Lavater before falling from favour again in the 20th century. It is now being revived again as some new research indicates that people’s faces can indicate such traits as trustworthiness, social dominance and aggression. The latter trait seems to be determined by the level of the hormone testosterone during puberty which affects the ratio between the height and width of the face – aggressive individuals are found to have wider faces.